I have a touch of melancholy lately. The kind that makes me want to press my forehead against a rainy or snowy window, sip cocoa, and lose myself in novels and movies in my pajamas for a few days. The season is just on the cusp of changing, and while I won’t have a few days to myself any time soon, I can fill my house with the comfort of stew. This is THE beef stew. It’s savory, hearty, filling, rich-but-not-too-heavy, and the flavor has just a hint of complexity. It’s the crowning jewel of my stew creations to date. The only thing missing is what Michael calls “a prospector bowl” (a pewter bowl to eat it out of). Some day, friends. Some day. The magic here is the combination of balsamic vinegar and a hint of dijon mustard. That mixture, paired with the classic flavors of beef, carrots, onions, and rosemary and pulled together with some great-quality beef broth makes this sauce just incredible. Thanks to the thickening trick, it’s hearty and thick enough to eat on its own, but it also makes a great topping to rice or mashed potatoes if you need to stretch it further. If you’re serving it on its own, you can certainly add 1-2 cups of diced potatoes to the stew as it cooks. Michael just much prefers to serve them with a batch of vegan mashed potatoes. We used homemade beef bone broth. The better quality broth you use, the better, but for those times when you’re in a pinch, our favorite broth “booster” is Better Than Bouillon Organic Beef Base . (It’s gluten and dairy free, no MSG). If you’re using it, you can use 2-3 tsp per 1 cup water or broth. It’s NOT whole30/Paleo approved, so be aware of that if you’re eating that way. The rest of the recipe is squeaky clean and ready to eat! p.s. If you’re on the hunt for a great slow cooker, we LOVE this one. It’s programmable and has lid clips so you don’t have any spills if you’re bringing food to a friend, potluck, or party. Feel free to assemble this the night before and refrigerate the crock. You can then just pop the crock into the slow cooker and set it to cook. Also, you can make this skipping the browning step. I just love the flavor it imparts. Brown the beef by heating a drizzle of oil in a large sauté pan. Working in batches, add a few pieces of beef to the pan and brown on all sides. When browned, transfer to the crock of a slow cooker. Repeat with remaining beef. Place carrots and mushrooms in with the beef. Add onion to the pan you browned the beef in. Stir to scrape up any browned bits. Add balsamic, Dijon, and broth to the pan and stir until well combined. Pour the whole mixture into the slow cooker over the beef, carrots, and mushrooms. Place rosemary on top. 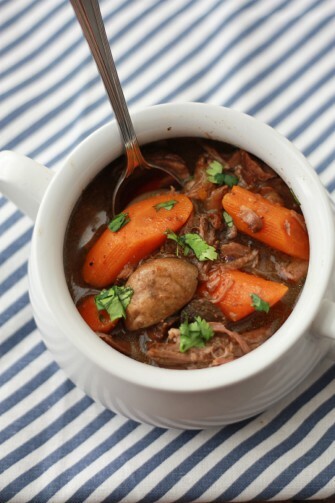 Cook stew in slow cooker on HIGH for 3-4 hours, or LOW on 7-8 hours. Shred beef into the broth mixture after cooking. In a small bowl, whisk together arrowroot and 2 Tbsp water. Pour into the slow cooker and stir to combine. It should almost immediately thicken. Serve when you’re ready! You can make it in a Dutch oven using the same method–cook everything in the Dutch oven, not a sauté pan. Bake it at 300 degrees for about 3 hours, or simmer it on the stove top for 2-3 hours. This looks simple enough for even me to make! This looks awesome! I want to try it with some sweet tators in there! And we would need some good rolls to mop up all the juice too! What can I use if I can’t find Arrowroot powder to save my life? You can use cornstarch or tapioca flour/tapioca starch for a GF version, or flour for a non-GF version. I find we get at least 6 adult servings out of it. Hope that helps! Should all of the ingredients be covered by the broth? Jessi – Mine typically aren’t. Were yours? Mine wasn’t so I am pleased to read this. There’s hope yet. So as it slowly cooks, it will be more watery? The arrowroot added at the end pulls it together in the way that cornstarch or flour would in other stew recipes. Without adding that thickener at the end, it will be more liquid because of the broth. If you’re not an arrowroot fan and aren’t paleo, you can absolutely sub in cornstarch or flour instead, then let it cook to thicken. I made this yesterday for dinner using baby carrots and red potatoes. Your recipe is AMAZING!! Super delicious! I had never made beef stew before this and am so pleased with how it came out. Thanks for sharing this! Oh, I’m so glad! 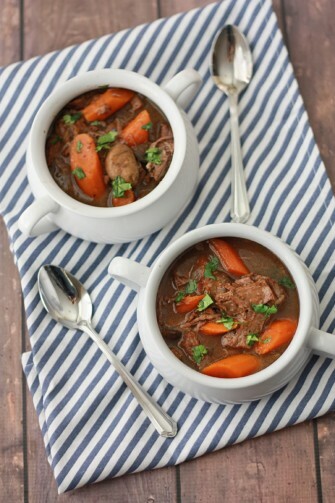 It’s our very favorite beef stew! Can you use almond flour to thicken? I would not. Almond flour will remain grainy and create a lumpy texture. I’d stick with arrowroot or cornstarch. If you don’t tolerate either well, I’d just skip that step and your stew will be thinner. I made this last weekend – added potatoes and didn’t add any thickener – it was delicious! Love the addition of balsamic and dijon – super tasty. Thanks ! This looks delicious! Is the onion supposed to be chopped? Quartered? Thanks! Reagan – My apologies! It should be diced/chopped. I’ll adjust the recipe instructions to reflect that. Thank you for the catch and happy eating! Made this tonight for dinner! So good!! I’m so glad you liked it! It’s one of our very favorites. My husband said he liked it although it was different, he said it was less traditional and more of a progressive flavor.. Thank you so much for posting this recipe!! I will use it as a base and maybe amend a few things for a different flavor?! ? Sounds like adjusting it will definitely suit your tastes better. I’m glad you tried the recipe and THANK YOU for the feedback! I made this for the second time last night. My first time it was just OK as I didn’t have fresh rosemary. This time I added 2 sprigs of fresh rosemary and the smell alone was incredible!!! I loooooove that addition!! I am good at doctoring flavors so I did add quite a bit of salt and pepper as well as red pepper flakes and some flavor God Italian zest. I love potatoes and added like 5-6 (hence the need for more seasoning) Put it over the top!!!! Thanks for this! I just made this tonight! We used our Dutch oven as suggested and it turned out so tender. I love the dijon and balsamic flavor along with the fresh rosemary. We did not thicken because we like it a bit soupier. I might add baby potatoes and more liquid next time to change it up! But the recipe is great as is too!!! I will definitely be adding this recipe into our rotation. Thanks for sharing! Bonnie – I’m so glad you enjoyed it! (and it’s *fabulous* with baby potatoes). Have a great day! I used this recipe for inspiration, with a couple of minor modifications. Wow, excellent! Rave reviews from the family too. (“You can make that again any time”, was the comment I think.) Added cubed new potatoes, as suggested, so that it was a whole-meal bowl (served with a home made bread). Also added about half cup diced turnip. Microwaved the carrots, potatoes and turnip, tossed in a little olive oil, for 5 min on 800 W setting. This ‘trick’ from Cook’s Illustrated ensures the root veg cook in the low temperature of the crockpot. Also added one stalk of cellery, chopped, just because it is a family favourite… :-), and added half a can of petit pois at the end, for variety … :-). I also doubled the broth/balsamic/dijon because of the extra veg (but not the rosemary, as I find this can be overpowering). I omitted the salt and pepper (but did add a tsp beef base to the broth for a little added oomph!). To Amber Kunz, subbing thickeners can be done, but you should know that root starches (potato, tapioca, arrowroot) thicken quickly at low tempertures and should be added at the end, grain thickeners (cornstarch, wheat flour) need to boil to thicken, and should be added to the crockpot at the beginning. Nut flours (almond, walnut, coconut, etc.) can (often) be substituted for flour in baking, but do not thicken sauces/gravys. Thank you for all the notes Frank! I can’t wait to try with some of your suggestions! Love this recipe!!! Made it last night in my Instant Pot because I was pressed for time. I added potatoes and didn’t have fresh rosemary, so I substituted organic Italian seasoning, and I also added some onion powder. I cooked it for 40 mins on the stew setting. We will be adding this to our normal rotation. Super tasty! I may add a tablespoon of tomato paste next time to give it another layer of flavor. I’m used to having some sort of tomato in my stews bu this stew was nice & different and is also good without. Thank you for the awesome keeper! Yum! I need to get an Instant Pot! I hear such amazing things about them! Perfect! I was scrolling down the comments to see if someone had tried this in an IP yet for timing purposes. Doing this tonight! I really want to jump on the instant pot train. Maybe for Mother’s Day! For any future Instant Pot/pressure cooker users, highly recommend subbing in pearl onions! I diced an onion per the recipe and ended up with bits of pulverized onion throughout. It wasn’t bad–the mashed onions actually did a pretty good job of “thickening” the stew–but if you want your onions intact, I suggest pearl onions. Thanks for the recipe, this was delicious! Made it on my first day of Whole30 with thyme instead of rosemary since I just had some on hand and it’ll definitely reappear throughout and afterwards. Oh, that’s good to know! Thanks for the tip! Are you supposed to sheed the beef before you put it in the crock or after it has cooked. Unclear in recipe. Lisa – Sorry for the confusion! You shred after cooking if you’re using a beef roast. If you use diced stew meat, there’s no need to shred. I’ll update my recipe for clarity! I tried this last night, and loved it, but I have to say that I think the measurement on the bone broth is too much. It barely thickened at all. Seems that is a problem I have with all recipes lately that require some sort of liquid, so that may be my issue, but just in case anyone else has a similar occurrence…. Also, I’m not sure of the serving portion on this, but wow, I could feed quite a few people with this recipe. Of course, I don’t have any teenagers in the house. Next time I think I can cut the recipe in half, as well as pare down the liquid in turn. Loved smelling this all day!! I’m glad you enjoyed it Tammy! I hope that decreasing the liquid makes it spot-on perfect for you next time! I’ve made this now many times and it always turns out lovely. We’ve substituted goat meat for the beef from time, and other mushrooms, and the results are always delicious. 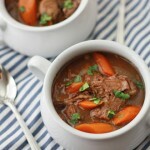 If you can save the liquid from a slow cooker roast and use it as the broth it is very flavorful. I don’t bother with the arrowroot flour since I didn’t think it made a lot of difference the times that I tried it. Thanks for the recipe! If you are adding potatoes, how far into the cooking (slow cooker) should you add them? Or right from the beginning? Emily – I wouldn’t add them till about 1-2 hours from the end. You CAN add them at the beginning, but they’ll more or less fall apart during the cook time. If you wait till the end, they’re MUCH better texture-wise. Oh, Amanda, I’m SO glad to hear it! I’ll have to try it with Italian seasonings sometime–that sounds AWESOME! Sam – Sorry for the delayed response! Several readers have made this using Italian seasoning in the past and really enjoyed it! don’t think I’ve used mustard and balsamic in this type of stew before, sounds really good! Thank you for this love this and a perfect slow cooker recipe! Sabrina – I REALLY love the subtle flavor they add. My husband HATES mustard, and this is the dish he requests for his birthday every year. It’s just lovely! I hope you love it like we do! Super delicious recipe! Thank you! Every bit was devoured by the family and this portion was perfect size for a hungry family of 5. I was a skeptic, but this is SOOOOOO DELICIOUS! I didn’t have rosemary or mushrooms (which I don’t like) so I omitted them. I also added some potatoes so added some extra beef broth! The flavor that the balsamic vinegar and dijon mustard are fantastic…something I would have never considered! Thank you! 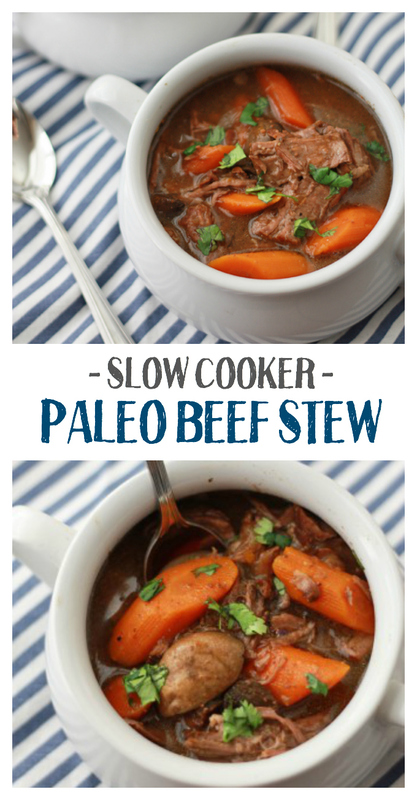 I have tried several beef strew crockpot recipes and none of them were ever great….until now! This recipe is all the things!!!! It’s literally perfect in every way! The browning of the meat and the fresh rosemary sprigs on top give this recipe the added *umpf* other stews lack. Try it, you won’t be disappointed! Kris – I’m SO HAPPY to hear you enjoyed it! It’s my husband’s favorite recipe and we make it all winter long. So cozy and comfy! I just tried this recipe for my family and it was a total hit. I loved it. I used tapioca starch instead of arrowroot (didn’t have arrowroot in my cabinet) and it was fine. The fresh rosemary was great and added a bit of bite to the end result. Thanks for the great recipe. My family enjoyed it on this cold January night. How wonderful! I’m so glad you enjoyed it! We made it yesterday! I’ve made this several times now. It’s a family’s favorite. I’m so glad to hear that! Thank you so much for brightening my day! I’m SO GLAD you loved it!!! It’s a favorite around here, too! Hi!! I have Mine in the slow cooker! Does this recipe freeze well? Thanks! Laura – We often freeze leftovers and thaw them. The carrots do get softer upon thawing, but the flavor is DELICIOUS! 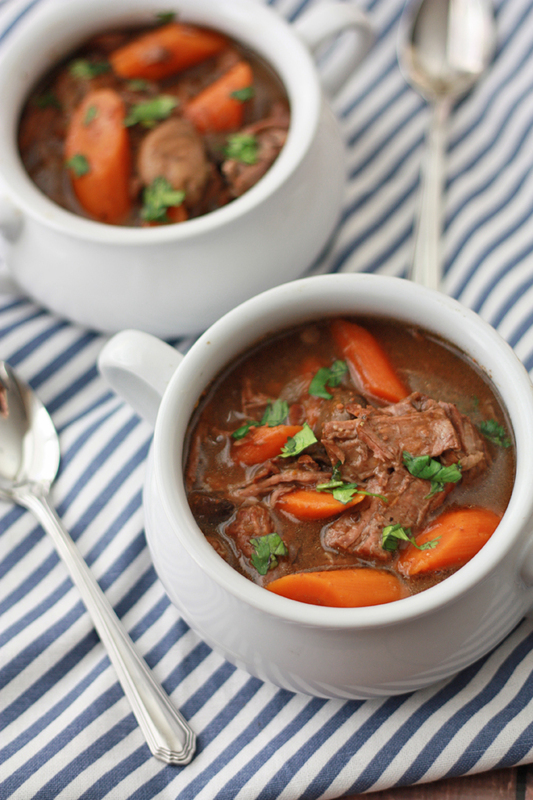 Very flavorful stew! Thanks for the recipe! I’m so glad you liked it! It’s our family favorite. Do you brown the beef first with any arrowroot flour? If I’m leaving the crockpot on low unattended while at work for close to 10 hours, should I add extra broth be safe? If there isn’t beef chuck available, any suggestions on different cuts? Haley – These are great questions! Browning the beef is an optional additional step you can take before cooking it in the slow cooker. IF I’m in a hurry, I skip the browning step, but if I have time, I like to brown it first (my husband loves the crispy bits!). In the recipe card, you’ll see the instructions for browning–brown the beef by heating a drizzle of oil in a large sauté pan. Working in batches, add a few pieces of beef to the pan and brown on all sides. When browned, transfer to the crock of a slow cooker. Repeat with remaining beef. Then, you’ll proceed from there. I don’t use any arrowroot–just the beef and some olive oil (maybe some salt and pepper). 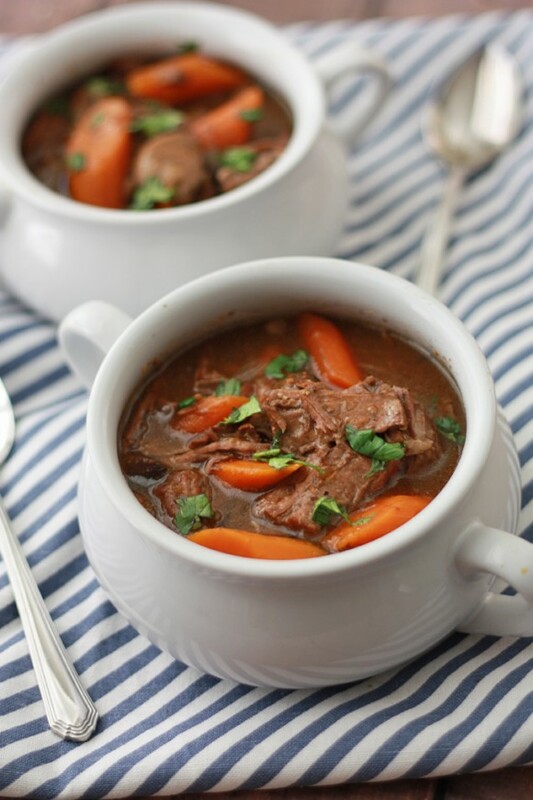 You shouldn’t need to add any additional broth to the stew throughout the cook time, since slow cookers don’t permit much evaporation and as the meat and veggies break down, they’ll add their own liquid to the stew. Basically any kind of beef roast will work for this recipe–use whatever you can find or what’s on sale. Feel free to ask your grocer or someone at the meat counter for suggestions if you’re nervous! I hope that helps! I’m cheering for you and hoping this recipe works beautifully for you!